Learn how Sukosol Hotels are doing their part and been recognised along the way! Read about our environmental, tourism and culinary successes at our prestigious property. Sukosol Hotels is proud to announce that once again all of its properties — The Sukosol, Bangkok; Siam Bayshore, Pattaya and The Bayview, Pattaya — have been awarded the TripAdvisor Certificate of Excellence for 2013. The award is given to establishments who consistently receive an "excellent" rating review from guests. We are pleased to announce that the newest member of the Sukosol Hotels’ family, The Siam, has just been named as one of Fodor’s Top 100 Hotels in the “City Chic” category for 2012. The hotel was chosen because it’s redefining the notion of urban Bangkok luxury and offering guests a one-of-a-kind city experience. Both the Siam Bayshore and The Bayview in Pattaya have recently been honoured as a Smoke-Free Hotel, Silver Star Award by the Green Leaf Foundation in co-operation with Thai Health Promotion Foundation, Tourism Authority of Thailand (TAT) and Action on Smoking & Health (ASH), a public healthy charity. Sukosol Hotels is proud to announce that all of its properties — The Sukosol, Bangkok; Siam Bayshore, Pattaya and The Bayview, Pattaya — have been awarded the TripAdvisor Certificate of Excellence for 2012. The award is given to establishments who consistently receive an "excellent" rating review from guests. Both properties have been constantly ranked amongst the top 10 hotels in their respective destinations. 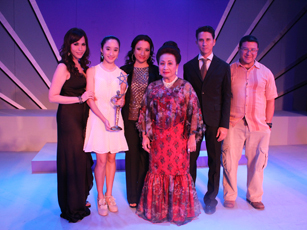 Sukosol Hotels is proud to announce that its owning family, the Sukosols, was presented with the Family of the Year Award at the Nine Entertain Awards 2012 on Wednesday, March 14. The Sukosol family was selected as the recipient of the award because their matriarch, Mrs Kamala Sukosol, has successfully installed in all family members a strong commitment to philanthropy. In addition, the Sukosol family was chosen as most exemplifying the spirit of the award by way of their public acts of charity and artistic/business achievements. And lastly, all family members were deemed to be upstanding citizens who represent good role models for today’s Thai youth. Expedia travellers have ranked the Siam Bayshore, Pattaya, among the world’s best hotels on this year’s Expedia Insiders’ Select List. The list yet again recognises individual hotels worldwide that consistently deliver excellent service, notable value and a great overall experience. The full list represents only a small percentage of the world’s top hotels and resorts from the more than 110,000 properties offered on Expedia. Agoda travellers have ranked The Bayivew, Pattaya, among the world’s best hotels and awarded it a prestigious Golden Circle Award. Each year, agoda.com recognises outstanding hotel partners by presenting them with a Gold Circle Award. The awards, launched in 2009, are unique to agoda.com and are intended to honour hotels that show commitment to providing a superior online product. The Siam Bayshore and The Bayview were awarded the EIA Monitoring Award 2011 in recognition of their commitment to and education of environmental concerns in and around their Pattaya properties. Environmental impact assessment (EIA) is a procedure for predicting environmental impacts of projects prior to their development, while post-auditing seeks to assess the accuracy of such predictions. The resort was found to have both met and exceeded all requirements and was thus honoured with receiving the highly sought-after accolade. The Sukosol, Bangkok has been honoured as a Smoke-Free Hotel, Silver Star Award recipient by the Green Leaf Foundation in co-operation with Thai Health Promotion Foundation, Tourism Authority of Thailand (TAT) and Action on Smoking & Health (ASH), a public healthy charity. Sukosol Hotels is proud to announce that in the “Awards for Tourist Accommodation, City Hotel, More Than 80 Rooms” category of the 8th Thailand Tourism Awards (aka Kinnari Awards) The Sukosol was given an Award of Outstanding Performance. Both the Siam Bayshore and The Bayview hotels in Pattaya have received the thumbs-up for being green and were recently awarded the ASEAN Green Hotel Award by the ASEAN Tourism Forum. The award recognised the most environmentally friendly hotels in each ASEAN country. The award was given in recognition of the two hotel's compliance with environmentally friendly and energy conservation measures. 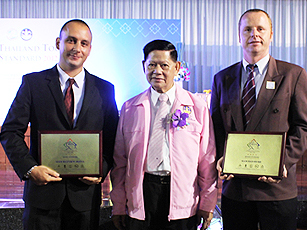 The Sukosol was awarded the EIA Monitoring Award 2010 in recognition of its commitment to and education of environmental concerns in and around its Bangkok hotel. Environmental impact assessment (EIA) is a procedure for predicting environmental impacts of projects prior to their development, while post-auditing seeks to assess the accuracy of such predictions. The hotel was found to have both met and exceeded all requirements and was thus honoured with receiving the highly sought-after accolade. 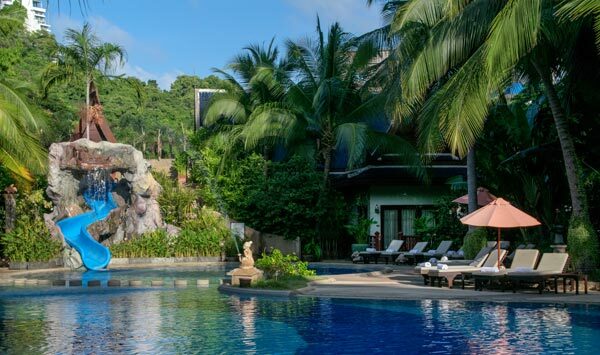 Expedia travellers have ranked The Sukosol, Bangkok, and The Bayview, Pattaya, among the world’s best hotels on this year’s Expedia Insiders’ Select List. The list yet again recognises individual hotels worldwide that consistently deliver excellent service, notable value and a great overall experience. The full list represents only a small percentage of the world’s top hotels and resorts from the more than 110,000 properties offered on Expedia. Sukosol Hotels is the proud recipient of the Total Energy Management (TEM) Award, bestowed on hotels with an exemplary record in energy consumption and concern for the environment.